The Unpalatable Truth – Pesticides in your food! 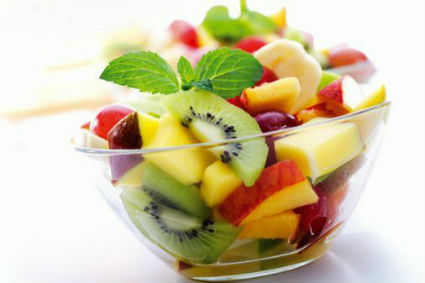 This presents a pretty picture, fruit and vegetables bursting with color and health, ripe and ready for the dining table. But are you ready for what this apparently healthy platter holds in store for you and your body? This question is very relevant in today’s marketing-oriented world of mass food production where speed and looks far outweigh natural goodness in the harvest of fruit and vegetables and indeed all food crops. Most foods that are grown with chemical fertilizers, insecticides and pesticides are bound to have prodigious amounts of residue that invariably find their way into our systems. In fact, a number of natural foods that we eat have an alarmingly high potential to absorb and retain pesticides, which by default reach your plate at the dining table straightaway. They include cherry tomatoes, apples, celery, cucumber, grapes, chillies, potatoes, sweet bell peppers, spinach, strawberries, peaches, lettuce, blueberries, milk, fatty meats, coffee, wine and chocolate, believe it or not! Logically, it’s only fruits and vegetables with thick skins that are removed before eating (melons, avocado, corn, etc.) that tend to have the lowest amounts of pesticide residue. Here’s a very tragic case of pesticide poisoning that has recently shaken up the general public, not just health-conscious people. For 26 long years, the government-owned Plantation Corporation of Kerala aerially sprayed Endosulfan over 4,700 acres in Kasaragod. Endosulfan is banned in many parts of the world, as a highly hazardous pesticide. But in Kerala it was sprayed for years in government-owned plantations. As the plantations are in a mountainous area, the pesticide residues settled on the soil and got washed away when it rained, into drinking water streams below. The tragedy got media exposure and has raised awareness. But all this, a bit too late for the unfortunate victims. The Kerala government, unable to face up to the media war against endosulfan poisoning in Kasaragod, banned its use for an indefinite period. The effects of that are already showing. The birds are back, there are butterflies flitting around, micro organisms are alive in the eco-system and nature is seemingly bouncing back. However, Endosulfan is still being used in various parts of India in Punjab, Karnataka, Andhra Pradesh and Assam, in cotton and tea production. But communities are not clear about the danger ahead. A lot of work needs to be done before the danger of not just Endosulfan, but of all pesticide poisoning can be stemmed. For individuals, organic food has many benefits. Eating organic means avoiding the pesticide residue left on foods, and it may even mean more nutrition. But organic food can cost more, meaning many families are unwilling to pay more for organic produce. If you want to balance budgets, while investing in only some organic produce, you can also buy fresh produce typically low in pesticide residue, like Onions, Sweet Corn, Pineapple, Avocado, Asparagus, Frozen Sweet peas, Mango and Papayas. Categories: Natural Mantra | Tags: Dry Fruits, eco-friendly, environment, food, Fruits, Grains, harmful, healthy, Insecticides, natural, Organic, pesticides, Platter, Pulses, sustainable, toxins, Vegetables | Permalink.